WIA and TWAIN Scan Drivers for the WorkCentre 6505. These drivers support network and USB scanning. Utilities for the WorkCentre 6505. This package installs the Address Book Editor and Express Scan Manager. 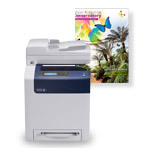 The Express Scan manager can only be used over USB and must also have the Scan drivers installed. Contains the entire CD image and launches the Easy Setup Navigator which can be used to install the print and scan driver software. Phaser 6500 and WorkCentre 6505 PANTONE color calibrated look-up tables and application support files.